Moto-Medic Inc. Provides Complete Auto Repair for All Makes and Models of Vehicles - Foreign and Domestic. If it’s Got a Motor, We Can Fix It! In the 30 years since we opened our doors, we’ve taken pride in providing reliable and honest service to every customer who trusts us with their vehicle. When you choose Moto-Medic, your vehicle will be personally inspected and serviced by one of our Certified Master Mechanics, many of whom have over 30 years of experience! We are the drivability experts! Our team has a reputation for identifying and fixing hard-to-pinpoint issues others have difficulty with. Have you noticed any of the common warning signs of failing brakes such as difficulty stopping, slow response, or a grinding and squealing noise? Our expert team understands brake systems in and out and can perform any repair needed to keep you and your vehicle safe. From a simple fix to a major repair – and even a complete replacement – Moto-Medic has experience working with all types of engines, including diesel and hybrid! We work with Jasper Engines & Transmissions to provide high quality replacements, and are passionate about working with our customers to keep their vehicles in peak condition with routine maintenance. Moto-Medic provides complete repair and replacement services for both automatic and manual transmissions. We’re partnered with Jasper Engines & Transmissions to offer great prices on high-quality replacement transmissions. Our master mechanics specialize in diagnosing and repairing automotive electrical problems, including advanced computer diagnostics and hard-to-detect intermittent electrical issues. From an AC recharge to part replacements, we can service the heating and air conditioning system in any make or model of vehicle. We offer complete radiator services including machine-powered radiator flushing, addition of chemicals, sealants and lubricants, pressure check, tests for leaks, belt replacement, cooling sensor replacement, and much more! Reliable and responsive steering is essential to the performance and safety of your vehicle, and maintaining a smooth ride will help keep your vehicle in top condition. 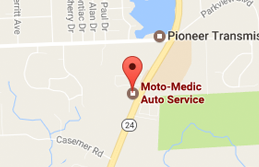 Moto-Medic can handle all front-end and suspension services with complete accuracy! If you have a number of vehicles that need ongoing maintenance and repairs, we can work with you and your business to ensure that your fleet always gets the service it needs! Don’t miss your annual M-DOT inspection! 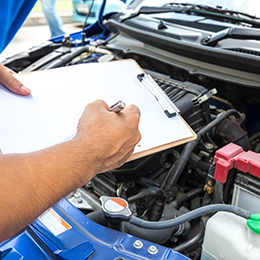 We offer inspections from a Master Mechanic officially certified by the Michigan Department of Transportation. Diesel engines require specific knowledge and expertise. Our Master Mechanics have the training required to perform any needed maintenance and repairs on a wide variety of diesel engines.